As I feverishly photographed my son and his friends before the prom, it occurred to me that something was not right. The boys looked as I expected in black tuxes and combed hair. But the girls were all wrong. Their dresses were simple and flattering. Their make-up was applied, not caked. The wind blew and their hair actually moved a little. What the heck? Where’s the black eyeliner? Where’s the stench of Aqua Net? Where, I need to know, are Madonna’s lace gloves? This was not the prom I knew. When I think of the prom, my frame of reference is 1987. I conjure an image of a me-shaped girl peering out from under a helmet of hair and a mask of make-up. I have to assume that today’s girls have been scared straight by their mothers’ bad 80s style. They are a sea of good choices, timeless in one tasteful dress after another. These girls will never look back and cringe at their prom photos the way my generation does. While my prom memories are mercifully selective, the photographs endure. They turn up like bad pennies over the years, concentrated shots of humility. When I happen upon them, I jump back like I’ve unearthed White Snake. People say that if you don’t like a photograph of yourself, you should wait five years and you’ll love it. These people were not photographed in the 1980’s. My hair was styled in a manner that defied both gravity and common decency. The look was achieved with the help of some mousse, a diffuser and the occasional scrunchi. If my style gurus were Madonna and Einstein, I totally nailed it. 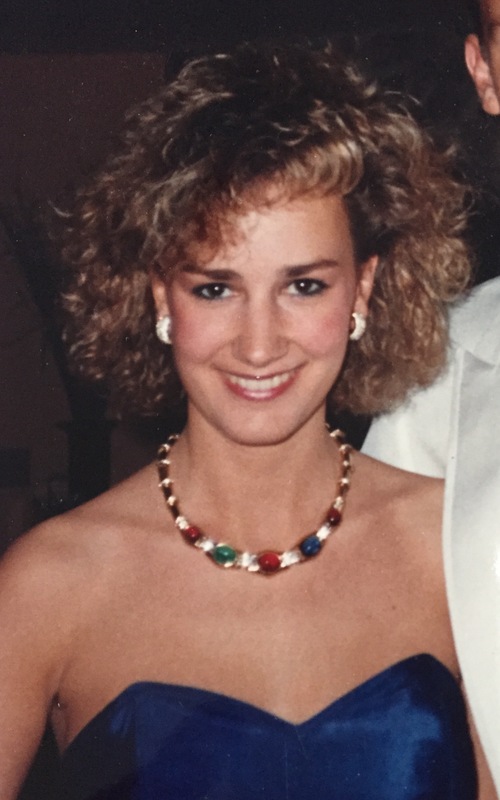 Maybe you had a perm, maybe you had bad highlights, maybe you had feathered bangs. If you were me, you had all of them. And you thought it looked pretty darn good. My dresses seem to have been chosen to compete with my hair. “Look at me,” they shouted. “I’m crazy and in bad taste too!” I had a dress that was skin tight and made of red suede, a female Eddie Murphy. I had another that was canary yellow and poofed out at the hips before going straight down, making me look like an anaconda digesting a giraffe. There was a white one, made of lace but somehow also impossibly tight due to a clever use of spandex and netting. The ingenuity that would later create the tech boom was dedicated to prom dress design in the 80s. Red suede. Always the perfect choice for springtime in L.A. 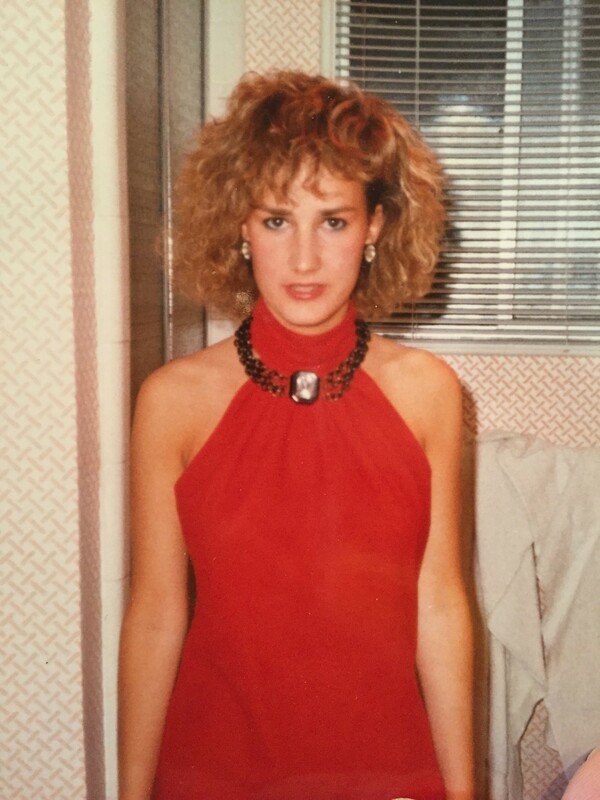 The style motto of the 80s was “More is More.” Put your make up on, and then put it on again. If your bracelets aren’t stacked all the way up to your elbows, keep ‘em coming. Eight or nine rings were standard, I mean God gave us ten fingers after all. Our lips were red, our brows were black and our cheekbones were Pat Benatar razor sharp. I look at these photos and wonder what boy would be brave enough to dance with any of us. 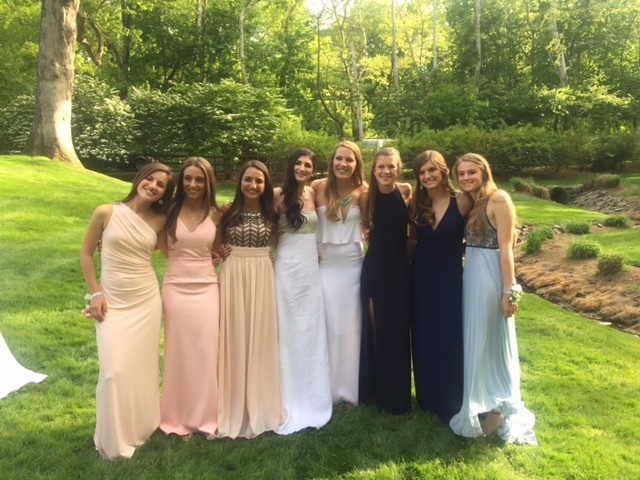 This current crop of prom goers seems to understand that a teenage girl doesn’t need much to look beautiful. Simple hair, a simple dress and a smile. I mourn the time and dignity we could have saved if we’d known this too. The good news is that my friends and I collectively think we look a lot better now than we did on prom night. Not one of us thinks we peaked in high school. What we’ve lost in collagen, we’ve gained in judgment. I’ve got a million photos to prove it.